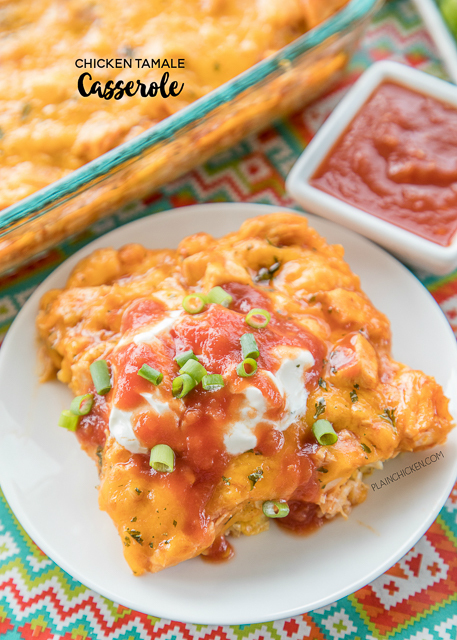 Chicken Tamale Casserole - a sweet cornbread crust topped with enchilada sauce and chicken. This is a crowd pleaser! SO easy and ready in minutes! 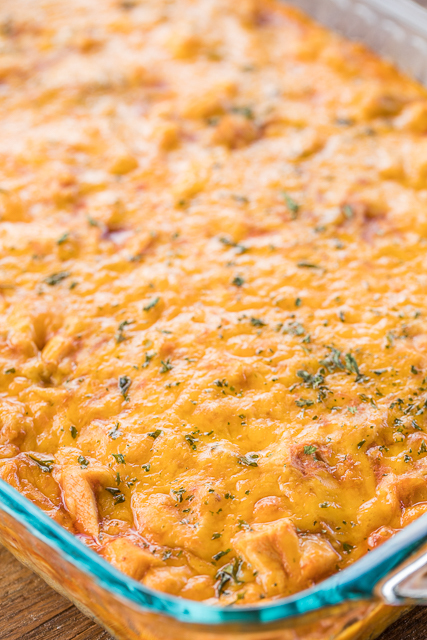 Everyone LOVES this recipe - even picky eaters. Top with your favorite taco toppings! Jiffy mix, creamed corn, eggs, milk, cheddar cheese, chicken, enchilada sauce. SO good! 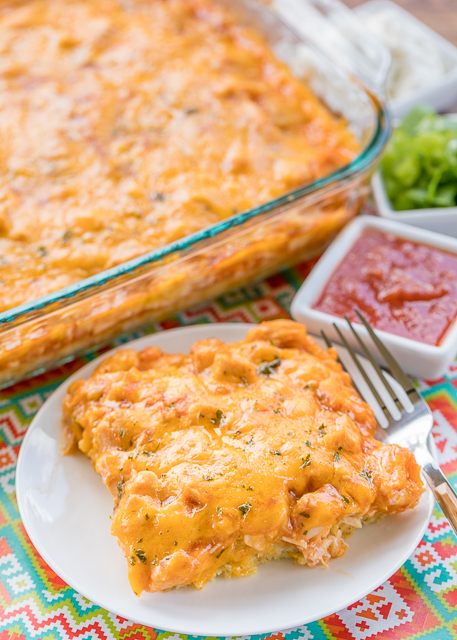 Great weeknight meal that will please the whole family! Add this to your menu ASAP! This is SOOOOOO good! I mean seriously delicious! The base of this casserole is a doctored up box of Jiffy mix. It has cream corn, cheese and spices mixed in. 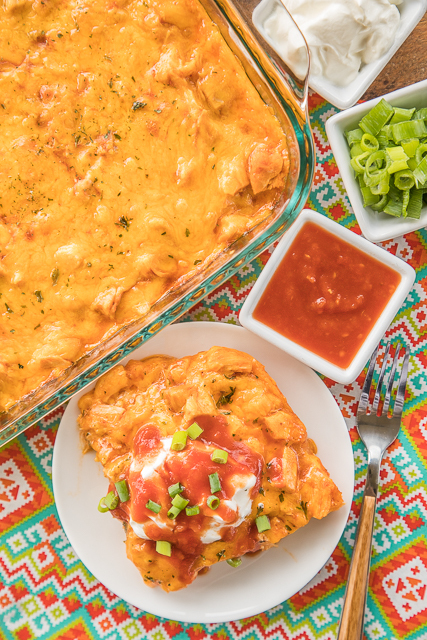 It is crazy good on its own, but it is even better with some chicken tossed in enchilada sauce on top. I used rotisserie chicken in this dish, and it only took minutes to assemble. I served it with some lime wedges and black beans. You must squeeze a lime wedge over this dish (and the black beans). It gave it a little zing and really put the flavors over the top. I am adding this to our dinner rotation. You should do the same. In a large bowl, combine muffin mix, corn, eggs, milk, chili powder, cumin and 1 cup of the cheese. Pour into prepared baking dish. Bake for 20 minutes. Toss chicken in enchilada sauce. Pour chicken mixture over cornbread and top with remaining cup of cheese. Bake for and 20 additional minutes. Allow to cool for 5 minutes and cut into 6 or 8 squares. Sounds delicious! I love anything made with Jiffy! So easy! Think I have all of the ingredients on hand too. Thanks! We had this for dinner tonight. My husband was a little hesitant as he is with new recipes, but we both loved it! Great for busy days and best of all I had everything to make it. I made this and it was a huge hit! I was skeptical at first that only one box of jiffy would cover a 13x9, but it turned out perfect! I added chopped red tomato, green onion, cilantro, and avocado as toppings, delish, and even the kids had seconds! These were delish! Easy to prepare, everything was on hand. Thank goodness for frozen, shredded rotisserie chicken! This is going into our rotation for the month. This was delish! Do you know if I can make ahead and freeze it? I think as long as you bake it first and then freeze it, it would be fine. Glad you enjoyed it! This was amazing! We used green chili enchilada sauce, and even my 85 year old Dad (not as willing to experiment as the rest of us) loved it! Thank you! Do you use red sauce or green when you make it? I have made it a couple of times and love it but I have always used green enchilada sauce, I actually prefer red enchilada sauce. I am making it today with leftover turkey. I use red enchilada sauce. Either is fine. Sounds delicious with leftover turkey!! Enjoy! Thank you for you reply. I found a can of red sauce that had not expired so I made the casserole today with Turkey. I can't wait to try it. I also added an extra package of corn bread and 1 cup of milk instead of 1/2 plus I doubled the spices and added an extra can of reg corn w/o liquid and 1 extra egg. I had to cook it for 30 mins the first round and 20 for the second. I will let you know how it turned out as soon as we eat. I cooked it early because that is when I felt good. Around 5ish I don't feel well enough to cook due to some health issues. Love this recipe. Thanks for sharing it. So I loved the flavors but our cornbread turned out really soggy - like really soggy. It was baked fully but I think the creamed corn was too much. Should I skip it? I haven’t had this experience. My cornbread has never been soggy, so I’m not sure what the issue is.